Turn to our Figaro chains when you are looking for a stylish gift idea! Give it as a birthday gift, congratulations gift, graduation gift, Valentine's Day gift or anniversary gift. Dads, moms, husbands, wives, sisters, brothers, friends, coworkers, sons and daughters can all incorporate our hollow bar gold chains into their collection of everyday accessories. Your gift recipient's face will light up when he or she opens the gift box which contains our yellow gold figaro chain. Hurry & order your chain today! Please consider that these Yellow gold hollow bar figaro chains by Glad Gold are available in 4 different lengths:Choose the 7 or 8 inch chains when looking for a durable bracelet, or turn to the 9 and 10 inch for a beautiful anklet. FINE YELLOW GOLD: Our beautiful Hollow Bar Figaro chain is made out of authentic 10k yellow gold in order to ensure durability and quality. FIGARO CHAIN: The figaro design featured on this bracelet chain is subtly stylish. 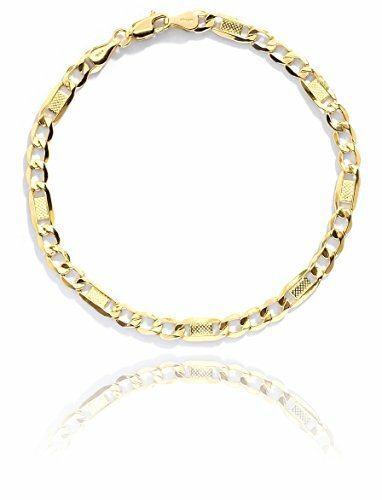 LIGHTWEIGHT BRACELET - LOBSTER CLAW CLASP: This chain is hollow, which means it is lightweight and comfortable enough to wear all day long, and its finished with a lobster claw closure that makes it easy to put on and remove. 4 LENGTHS AVAILABLE: Choose from a 7", 8", 9", or 10" figaro chain necklace. FANTASTIC GIFT IDEA: Since the hollow bar chain is essentially unisex, these bracelet make great gift ideas for moms, dads, girlfriends, wives, husbands, boyfriends, etc. for all occasions such as birthday, valentine's day, holiday, Christmas, anniversary, or engagement. If you have any questions about this product by Glad Gold, contact us by completing and submitting the form below. If you are looking for a specif part number, please include it with your message.